This quote was said to me about nothing in particular; it was just Melissa realizing her own limitations. I don’t expect Melissa to do all of the cooking and cleaning, and I don’t expect her to be a saint all of the time either. I expect her to be herself, and I love her unconditionally and appreciate her for who she really is. And I’m sure she does the same for me. I came across this great blog post on the web today that reinforces some of the techniques I picked up for meeting someone new. In the beginning, it is all about “saying hello” with your eyes before you even say a word to each other. I’ve written previously about The Art Of Smiling. But the post today reminded me of an important developmental step I did in high school. That’s right, when I was in high school I used to walk around the mall making brief eye contact with girls my age. When coupled with the smiling technique, you’ll be able to say “hello” IRL, not just in your head. Forget about being a Hipster. Are you a Choister? Sometimes we are just bogged down with too many choices, and we forget to look around us and be happy with what is already around us. This is especially true with relationships. How many of us broke up with someone because we thought we could find someone else better? Today’s twenty- and thirty-somethings approach life and love very differently than past generations. The explosion of choices now available has impacted our desires and expectations, and led us to reconsider traditional decisions. Young men and women are increasingly reluctant to make the ultimate commitment and get married, and much of that is due to all the other glittery options out there competing for our attention – friends, professional success, 30 Rock, the people in the world you haven’t yet dated. If you love choices and think the world is your oyster, you’re a choister. Hey, y’all, you don’t have to be so choosy. Just make sure your expectations are truly important. Don’t limit yourself to only dating people who love Wilco (although that is rather important). And don’t be afraid to commit, either! When Do People Break Up? The infograph says it all. This is likely skewed more towards the younger (high school and college) crowd – as evident of the higher numbers around spring break. Maybe people want to be single when they go away for the week so they break up beforehand. But more likely they “got in trouble” while apart from their significant other. 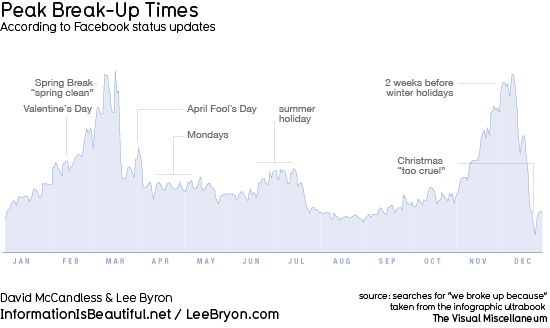 Oh, and look at the spike right before Christmas time. Other than cheating, nothing seems to motivate people more to finally break up than having to buy a present for someone they don’t really care about anymore.